Nicaraguan binders and a delicious selection of high-grade Nicaraguan fillers. Each cigar is finished with a handsome pigtail top. The flavors are medium to full-bodied with a sweet earthy richness and a spicy complexity. super-premium cigar, yet the attractive price-tag of a value bundle. 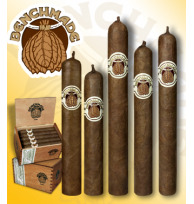 Available in 5 traditional sizes in elegant cedar boxes, Benchmade is the new benchmark for the value cigar.